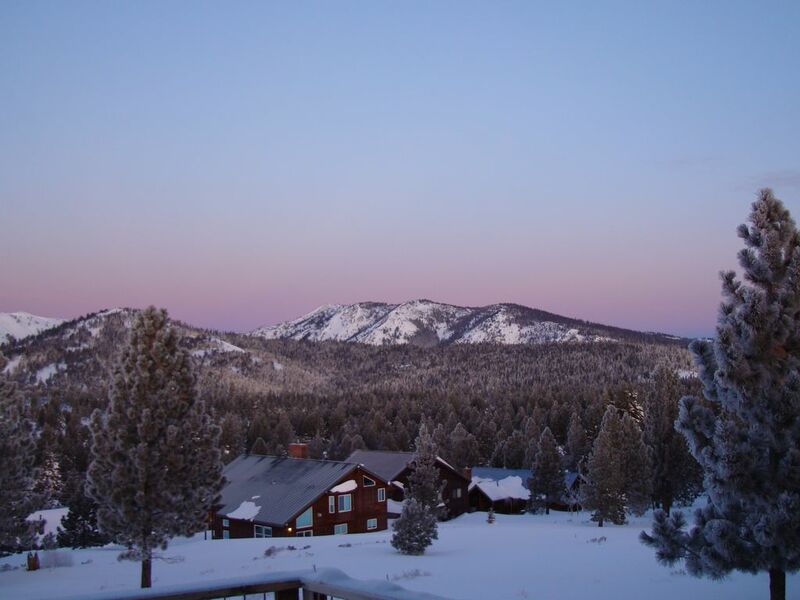 Sweeping views of the High Sierra await you from our gorgeous mountain chalet. The rooms are exceptionally bright and sunny, and thanks to our unique location, you will enjoy magnificent sunrise and sunset views. Situated on a highly desirable street in Tahoe Donner, this home features the finest appointments in a contemporary mountain lodge style: vaulted ceilings, extensive interior woodwork, slate foyers, 3 fireplaces, travertine marble bathrooms, gourmet kitchen, 3 decks, hot tub, wireless high-speed internet, and more. Located in Tahoe Donner, a residential community in Truckee, our chalet is within 5 minutes of superb Tahoe Donner amenities: cross-country ski center; downhill ski resort; 2 recreation centers with fitness center, swimming pools, hot tubs; sledding hill; golf course; private beach, clubhouse, and boat launch on Donner Lake; driving range; playgrounds; hiking trails; mountain bike trails; equestrian center; tennis courts; fine and casual dining at the Lodge. Near the world class ski resorts of Squaw Valley, Alpine Meadows, Northstar, Sugar Bowl, and Royal Gorge (cross-country), you can be on your skis in 20 – 30 minutes. Our chalet is 30 minutes from Lake Tahoe, 40 minutes from Reno Airport, and 3 hours from the San Francisco Bay Area. Located well back on a quiet street, our chalet affords privacy and relaxation. The open floor plan is ideal for special gatherings. Our gourmet kitchen features granite countertops and stainless steel appliances and is well-equipped for those who love to cook. For a break from the great outdoors, we offer games, movies and an extensive selection of current fiction. We welcome families with children and provide children’s games, puzzles, movies, books, and a portable crib. Bedrooms feature lodge-style furnishings, high thread-count sheets, and cozy duvets. Every bedroom has a view. The large, luxurious master suite includes a fireplace and marble bathroom with separate tub and shower with spectacular, yet private, views. A washer and dryer are available for your convenience. We are outdoor enthusiasts from the SF Bay Area who love all that the mountains and lakes have to offer - both in summer and winter. We are avid skiers and wanted to share this sport with our children. Our families bought this home together when our kids were just babies. We wanted a comfortable home where we could spend winter weekends with family and friends and have the space to hang out, relax, cook. We started out as 'winter people' with a love of Squaw Valley, but we soon discovered how great summer is, too. We enjoy taking advantage of the amenities and activities offered in Tahoe Donner, in particular cross-country skiing and, in summer, enjoying the private beach club on Donner Lake. Quite simply - we were overwhelmed by the setting of this brand new home. The views are breathtaking. It was love at first sight. Smart TV with internet/streaming connectivity; log in to use your Cable TV account, Netflix, Hulu, Amazon Prime, etc. Very Nice cabin. Excellent views! The chalet is an amazing home for a family get away to the mountains. Fabulously comfortable, amazingly convenient to lots of ski areas and sledding, the chalet is bound to be one of our family's go to destinations. Jennifer was an amazing host. Could not imagine a more lovely spot to spend a week. Thanks, Tim. I'm so glad you enjoyed all the snow. It does feel like you're on top of the world here. Hope to welcome your family back again! We were so comfortable and happy in this beautiful mountain chalet! Two families (9 total) fit so comfortably with room to spare and had such a great time. Hot tub babysitter came in quite handy as did the proximity to the Tahoe Donner Ski Resort. We’ll be back for sure! Thanks, Keith! The hot tub is always a hit with both young and old. I'm glad you had plenty of room for your families to relax and enjoy the snow. The views from both front and back of property are fantastic. Spacious deck off the back overlooks Donner mountain range. Plenty of space in backyard for kids to play, etc. Kitchen included all needed amenities and property layout helped kids and adults conduct their own separate fun. Cabin is conveniently located next to ski resort and downtown Truckee. Would definitely like to stay here again. Thanks for your review Mark. The combination of a quiet natural setting with fantastic views yet proximity to town and several ski resorts are what sold us on this home! Our kids love the snowplay right around the house, too. Fantastic home on the top of the hill! Watch the sunrise and the sunset from this true 360-degree-view home. The great room is expansive with a family sized dining table and ample, comfortable sofas. A great location and a great home. The owner, Jennifer, was very helpful and easy to deal with. We will certainly be back. Highly recommended. I'm so glad you enjoyed our home. It's nice to connect with fellow cross-country enthusiasts. We hope to welcome you back next winter. This house was the perfect spot for our family! Big rooms, big living space, wonderful views out both sides of the house. My kids loved playing in the hot tub and playing in the snow in all the space around the house. Master bedroom was a great retreat and the beds were very comfortable. We will definitely be back again! I'm happy that our layout worked well for your family. We never get tired of that fabulous view! In summer relax on the front or back decks and take in the view. Hiking and mountain biking trails start right down the street. In winter we have sledding and snow play right at the house.